Busting Myths About Nuts & Weight Loss, Gut Health, Acne & More! There are a lot of beliefs and myths when it comes to nuts. Everyone from the public to experts in health have an opinion on nuts and your health, but these aren’t always supported by good science. 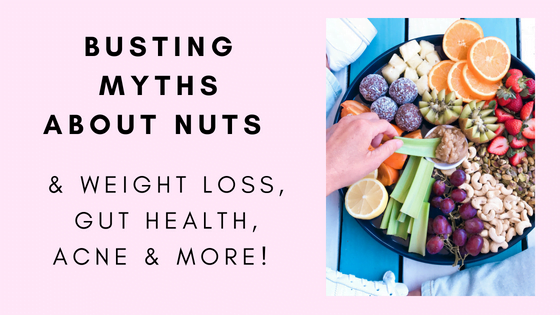 So let’s have a look at some of the most common myths surrounding nuts and separate fact from fiction. Nuts contain nutrients which can help control appetite such as healthy fats, fibre and protein. Healthy fats can reduce our desire to eat by switching on some of the satiety hormones in the intestines. Studies have found nut eaters excrete around 10% more fat in their stools, meaning that they absorb less fat and energy. FACT: Salted nuts still contain all the nutrition and health benefits of raw or natural nuts – they just have a higher sodium (salt) content. In general, a diet high in sodium can increase your blood pressure, which in turn increases your risk of heart attacks and strokes. However, there is some emerging research that found that those who ate salted nuts as part of a healthy diet, had the same health benefits of unsalted nuts, with no rise in blood pressure! This could be due to the heart healthy nutrients in nuts (healthy fats, arginine, fibre, antioxidants: vitamin E, copper, manganese, selenium and polyphenols) which may offset any negative effects of salt! And because people like the taste of salted nuts, they are likely to consume nuts more often instead of other unhealthy snack foods! Until more research is undertaken, it’s still recommend you consume raw/dry roasted unsalted nuts your everyday nut choice, and enjoy salted nuts as a healthier party food alternative. FACT: There is no evidence to suggest that nuts cause acne. There is some evidence to suggest that diets based on products with a high glycemic index (GI) leads to hyperinsulinemia, aka elevated insulin levels. Elevated insulin levels stimulate the secretion of androgens and cause an increased production of sebum, which plays a fundamental role in the cause of acne. Nuts can actually help to reduce the GI of a meal containing carbohydrates due to their healthy fat content. The healthy fats take longer to digest, and slow the rise in blood glucose. FACT: A serving of nuts is 30grams or a handful. For almonds, this is equivalent to around 20 almonds. FACT: Activated nuts are nuts that have been soaked in water for a period of time (usually 12-24hours). The soaking is thought to breakdown some of the proteins, starches, oils & other nutrients in the nuts making them more digestible. The activation process is also thought to breakdown phytates – a plant seed compound which binds to minerals (e.g. iron, calcium and zinc) preventing their absorption. So hypothetically, this means we should also be able to absorb these minerals better. However there is actually very little evidence that activated nuts provide any additional benefits. No research has been done to show what effect, if any, soaking has on nuts. Phytates have a reputation of being an anti-nutrient but the reality is quite different. Phytates have antioxidant and anti-inflammatory effects, appear to have anti-cancerous properties, may affect carbohydrate metabolism and glucose control, improve bone mineral loss and possibly even reduce kidney stones. If you enjoy activated nuts, then that’s great & you should definitely eat them, but you will still receive health benefits from regularly eating nuts that have not been activated. FACT: Nuts act as foods (prebiotics) for the bacteria (probiotics) in your gut. Nut skins in particular, appear to play an important role since they are rich in fibre and phytochemical compounds, with antioxidant and anti-inflammatory properties. Consuming nuts may increase the growth of healthy bacteria in your gut. This can cause healthy amounts of bloating and positively impact your gut health. This is still a very new area of research, so stay tuned for more. FACT: Research shows that more fat is absorbed from nut butters/pastes than whole nuts. It’s likely the fat is trapped in the fibrous structure of the whole nuts and is excreted from the body. Although the more you chew nuts, the more fat is released. This is not to say you should avoid eating nut butters/pastes, but rather have a variety of different nuts and nut butter. Choose a nut butter that has no added sugars or oils and enjoy them with celery, banana etc. FACT: There’s no good evidence that avoiding nuts is helpful for people with diverticular disease – in fact it may even be counterproductive, as nuts are a valuable source of fibre. FACT: It is often bantered around to delay the the introduction of nuts until at least 12 months of age to reduce the risk of allergies. However there is currently little evidence to support this recommendation. The Australian Society of Clinical Immunology & Allergy (ASCIA) recommend that “when your infant is ready, at around 6 months, but not before 4 months, start to introduce a variety of solid foods, starting with iron rich foods, while continuing breastfeeding. All infants should be given allergenic solid foods including peanut butter, cooked egg, dairy and wheat products in the first year of life. This includes infants at high risk of allergy”, as there is actually some evidence that delaying introduction of foods like nuts, may actually increase (rather than decrease) allergy. The 2013 Australian Dietary Guidelines recommends introducing nut butters and pastes from 6 months of age. Whole nuts should not be given to children until after five years of age due to the risk of choking. Smooth nut pastes or ground nuts added to other foods are a great way to make sure even young children can benefit from a small handful of nuts each day. When giving children whole nuts (or any other food which could be a choking risk) ensure that they are sitting down to eat and supervise them closely. Encourage them to eat small amounts at a time and to chew their food well. FACT: Nuts Are Safe To Eat During Pregnancy. Some women have been advised to avoid eating nuts during pregnancy and breastfeeding to reduce the risk of their baby developing allergies, but there is no good evidence to suggest that this helps. 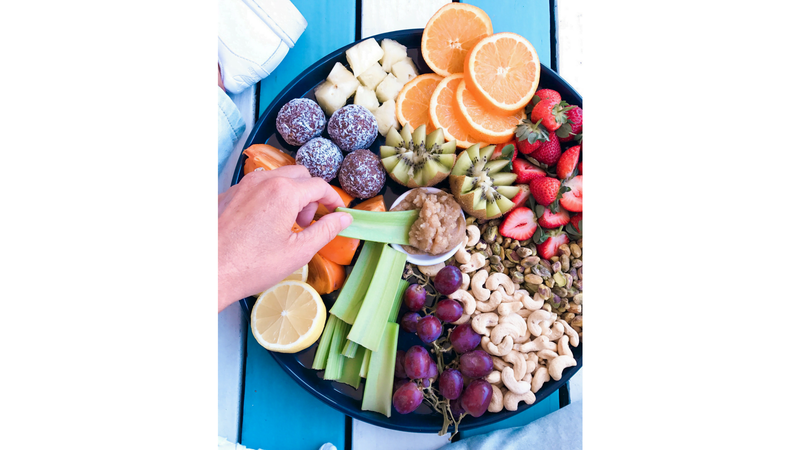 The Australasian Society of Clinical Immunology and Allergy advise against restricted diets, which can adversely affect the nutrition and weight of both you and your baby during pregnancy and breastfeeding. If you have a nut allergy yourself, obviously you need to avoid those nuts you are allergic to during pregnancy as well. FACT: There are only small nutrient differences between raw and roasted nuts. Heating reduces the water content so the mineral content appears higher. B group vitamins are not heat stable so they will be reduced in roasted nuts. Roasting can also cause the nut skins to fall off and since they are a good source of fibre and antioxidant compounds, consuming the skins is a good idea. Both nuts can be enjoyed with health benefits. FACT: Raw and roasted nuts are gluten free provided they don’t have any other flavourings added. Always check the ingredients list for any gluten containing additives such as thickeners or maltodextrins. Nut meals such as almond, hazelnut and chestnut meals are a great alternative to gluten based flours. Adding nuts to a gluten free diet can also help boost the nutrient content of the diet, particularly fibre. FACT: Eating approximately two handfuls (60grams) of nuts/day can significantly reduce your total and LDL cholesterol, which can significantly reduce your risk of heart disease.